Emsi compiled data from CCV, the U.S. Bureau of Labor Statistics, the U.S. Census Bureau, and various education studies and surveys, and used its Multi-Regional Social Accounting Matrix model to get a closer look at the return on investment and economic impact for CCV. The results of the study reflect information from fiscal year 2015-16. CCV provides a significant return on investment for all of its major stakeholder groups. For every dollar spent on their CCV education, students can expect $5.20 in future earnings. Graduates will see an increase of $14,200 in annual earnings, compared to a Vermonter with a high school diploma. This translates to roughly $568,000 over the course of a working lifetime. For every dollar spent supporting CCV, taxpayers gain $17.90 in added taxes and public sector savings. For every dollar spent on CCV, society as a whole receives $13 in revenue and social savings. 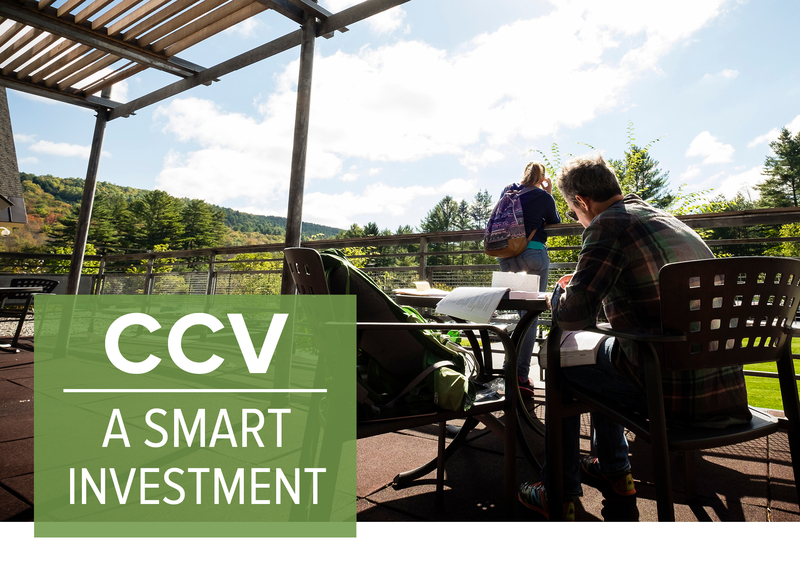 CCV has a significant impact on Vermont. In 2015-16, CCV added $251.1 million to the statewide economy. This includes the College’s spending on employees and daily operations, money spent by students who would have left Vermont if not for the existence of CCV, and money generated by alumni who are now working and living in Vermont. From the perspectives of students, taxpayers, and society as a whole, the impact report concludes that CCV generates significant value for Vermont. The College benefits Vermont’s workforce by training students and expanding the talent pool, thus reducing brain drain and attracting and retaining Vermont businesses. It provides access to an affordable education with long-term benefits for alumni and the communities in which they live and work, resulting in increased earnings and savings, and improved quality of life. CCV serves the greatest number of Vermonters, the greatest number of first generation students, and the greatest number of economically disadvantaged students: CCV grows people, the workforce, and the economy.